About Me: and what makes me qualified to help you build your shed. I love building sheds, designing sheds, and making shed plans. 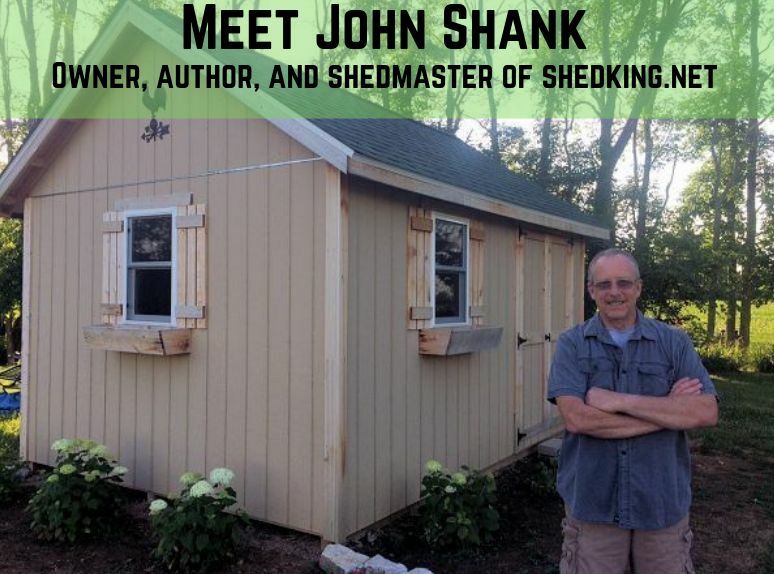 Hi, my name is John Shank, and I am the owner and shedmaster of Shedking.net. I am also certified remodeler with NARI, The National Association of The Remodeling Industry, Dayton Ohio Chapter. I built this website in the hopes that I can share my extensive shed building knowledge with you so that your shed building experience is a fun and enjoyable one! How I got into building sheds professionally. I graduated from college back in 1976 (yes, a looooong time ago) and went to work for Kroger's as a Manager. My degree was in business management with a minor in computer programming. During my 22 years with Kroger's, I was always building things. Furniture, decks, sheds, small wood projects, you name it. My true love was working with my hands and building things with wood. It was a passion of mine and something I loved to do in my spare time. Although working as a manager at Kroger's didn't give me much spare time for my woodworking interests! I will tell you that the one primary reason I went into grocery store management was because my big brother, whom I totally admired, was a manager for Ralph's grocery out in California. Well, I just had to be a grocery store manager too! So that's what I did! Being a grocery store manager was not a big mistake, but the long hours I worked and being away from my family made me want to do something else. Something I really loved to do. Maybe I could make money doing what I loved to do. Making things out of wood! Well to make a long story short, I quit Kroger's. Yes, I delved into a few other areas of interest too! I got my series 6 license to be a mutual funds broker and sell insurance. Nope, I didn't like that. I also studied to be a home inspector and almost bought a franchise for it. Nope, that didn't work out either! Low and behold, I started building sheds for a company called Heartland Sheds. For 2 hard years, I built sheds professionally. Talk about getting tired! I used to build sheds on the average of 1 per day! I could barely get out of my truck at the end of my shed building day. I was so sore and tired! Shed building: I learned everything I could. Although I was dead tired from building sheds professionally, I learned everything there was to building sheds. I learned how to build sheds to satisfy local building codes. I learned the best way to anchor sheds, build floors, walls, shed roofs, and the best materials to use to build sheds with. How to protect them from the weather. I learned it all. I became an expert in building sheds the right way. Along comes Solo Build it! I have always had the desire to be self employed. Maybe working all the long hard hours at Kroger's and the grueling work building sheds steered me towards using my knowledge in some better way. Around 2002 I had started following a Ken Evoy. Ken was a doctor. But he also had started a few very profitable websites of his own. One was selling penny stocks, and the other was children's toys. Both were hugely successful. Ken had the keen idea to start a business helping others. Helping and showing others how to not just build a successful website, but a successful business. Back then he called it Site Build It. Today the name has changed to Solo Build It. The main purpose of Solo Build It was to show people how to successfully build a business with a website, centered around something they had a passion for. You see, if you do something you love to do, and think you could share that passion with others who are looking to learn something from you, you could build a business around it. And make money from your passion! My passion: sharing my knowledge of shed building. This idea of building a business website around something I loved to do had me intrigued. I had to think about what it was I could share with people. Something I too loved to do and could maybe make a little money at. I can't say that I loved to build sheds, but I thought maybe I could share that knowledge with people. Along the way, I did start a website. It wasn't with Solo Build It. I had to take a cheaper route (I was dead broke at the time!). Ken Evoy had his website program developed and was charging $300.00. That was for a year of membership. Well after 2 years of having shedking hosted with another website service, I decided to take a leap of faith with Ken Evoy and Solo Build It. I took out a personal loan to pay off some debt and used $300.00 of that loan to buy a 1 year membership to Solo Build It. Solo Build It and Shedking: I couldn't be happier! Joining up with Ken Evoy and Solo Build It was 'the best' business decision I have ever made! I'm making money at something I truly have a passion for and love to do. It has not been an easy journey believe me. There have been lots of disapointments along the way. But the rewards and benefits have far outweighed them. I now make much more in a week then the yearly cost of being with Solo Build It. My journey has lead me to be able to not only build a profitable business around what I love to do, I have also learned how to do things like draft shed building plans and write ebooks. I can branch out into other areas of interests too and build businesses around them. Things like virtual reality and augmented reality. I am already using these two things to help promote my shed building site. Your passion: build your profitable business like I have. If you liked my 'about me' page and how I am using my passion and knowledge of shed building and turned it into a profitable business, you can learn more about using solo build it by visiting the link below.